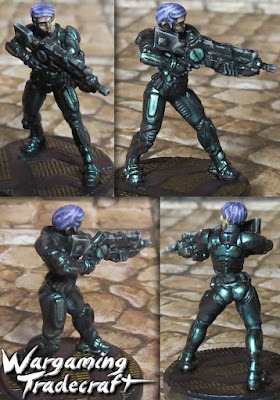 This post is designed to be both a tutorial and review on some of the colour shift paints available today. 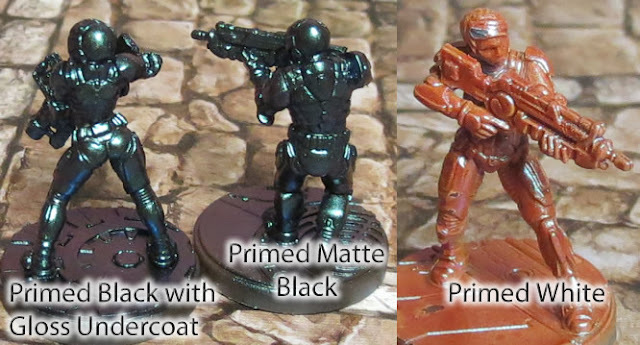 Many of you are familiar with Green Stuff World's line, but there's also paints available from Turbo Dork which have been creating some interest in the community lately. What are colour shift paints? Essentially they're paints that are a different colour depending on the angle you're looking at them or the way the light is hitting them. Typically you have one colour in the light and another in the shadow. You may have seen these kinds of things on sports cars or in nature like on beetles and pearls. 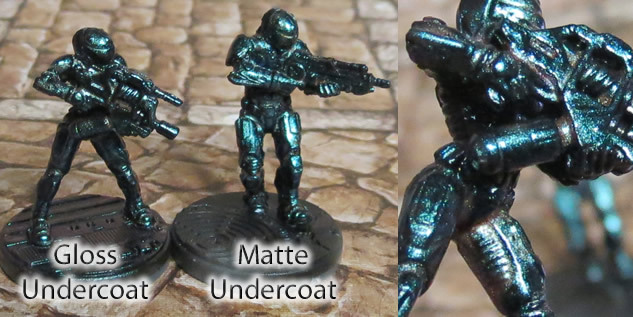 First, I'm going to cover how you're supposed to apply colour shift paints to your miniatures. Then, I'm going to discuss some alternate Do's and Don'ts when painting with them and include unique techniques that you can use. Finally, I'm going to summarize my feelings on the differences between the products offered by TurboDork and Green Stuff World. Full Disclosure, TurboDork sent me a few free samples for review purposes. Both companies recommend the following steps. I'll be using Green Stuff World's Martian Green on a miniature and TurboDork's 3D Glasses on both miniatures and some spoons. 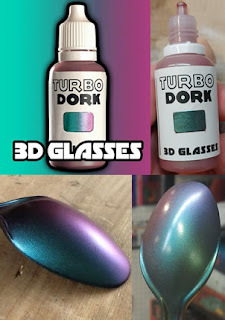 * Note * After writing this tutorial/review, the TurboDork paints weren't quite performing as advertised, but it basically came down to application. The paint applied to the miniatures in the same was as the Green Stuff World paint did match the colour swatch on the bottle so I thought I'd done it right. 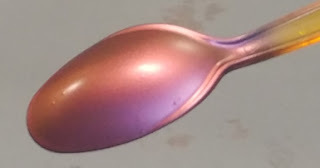 I looped back and tried out the TurboDork paints again using spoons and thicker layers of paint, which created the results I was after and I'll go into detail below. The two key elements here are to paint the miniature black, then apply a layer of gloss. I started by airbrushing black primer. Then airbrushed a few layers of Liquitex Gloss Varnish. Using an airbrush keeps details while priming and would allow you to paint colour shift into small areas instead of the whole miniature. You could definitely pick up some gloss black primer from a hardware store or a black primer followed by gloss varnish too. To be on the safe side, we also mixed some of the paint up real good. In the interest of testing things out, (The IT Guy part of me has to break stuff to gain a comprehensive understanding of how stuff works. ;) I found that while you definitely want to prime the miniature black, you don't have to gloss it if you don't want to. The gloss does look better / smoother and gives you nicer gradients, but the difference isn't large enough that it's a must do. This is definitely a technique that lends best to an airbrush, but you do have the option of using a paintbrush as well. You'll notice that the wet paint will look different from the final result, so plan based on what the label looks like. 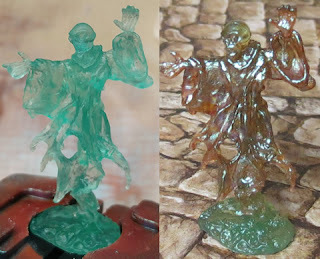 It might even be a good idea to paint a test mini of your own if you plan on using these paints on show pieces. For best results, both manufacturers recommend applying multiple thin layers with an airbrush until you get the desired look. I still used some thinner and retarder as I usually do when airbrushing to help flow and prevent paint from drying on the needle. 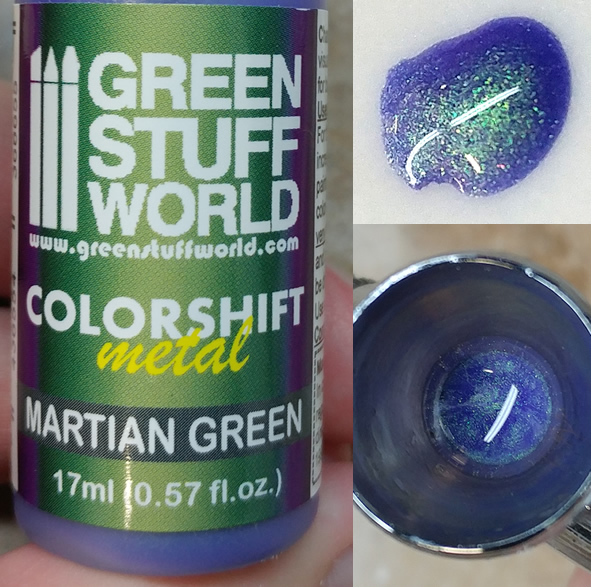 In the photo below, you can see the first layer on the left and the final layer on the right of the Green Stuff World Martian Green paint. You can see that at first, you mainly just get the highlight colour while the shadows remain mostly black. After subsequent layers, things become more obvious. 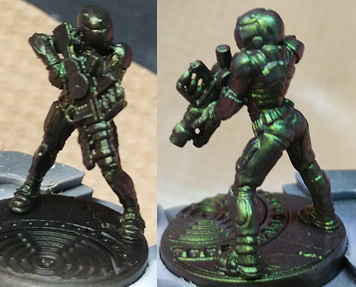 I discovered that with the TurboDork paints, light layers don't turn out quite as well. You still get a nice metallic finish, but not as clean and dynamic on the shift side of things. 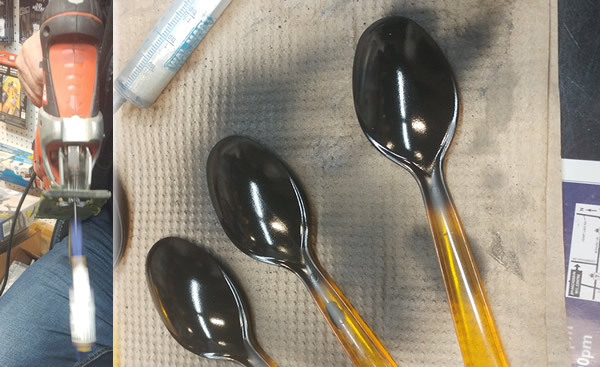 Worth noting that the miniatures you'll see painted in this tutorial were painted with the recommendation of multiple light layers, like the spoons below, which did end up matching the colour swatch attached to the dropper bottle so I thought I'd achieved all I could. Left to Right, applying multiple thin layers of paint. Below you'll see the same 3D Glasses paint applied with a more normal to heavy coat of paint. The colour is more vibrant and the shift becomes much more obvious. This vibrancy is unfortunately missing from many of the example miniatures due to the reasons stated above. 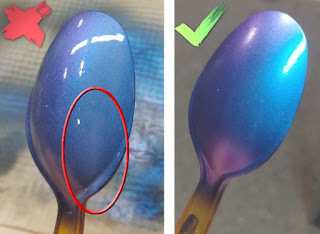 Viewing the spoon from multiple angles after applying the 3D Glasses paint thicker. 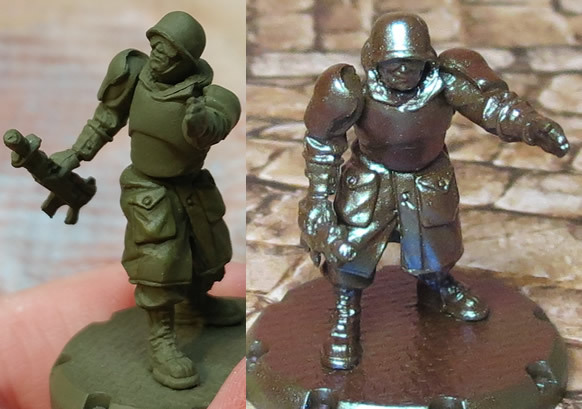 I tried this same approach on the Green Stuff World paint, and didn't notice a dramatic difference between light coats and heavier coats. If you paint colour shift on too thick, you'll see it pool. So, like any paint, don't paint it so thick it pools in areas and you'll be fine. Applied with thicker layers like TurboDork's. If you use a paintbrush, the key things to work at is to try and apply uniform thin coats that don't pool in the recesses and try to keep your brush strokes in the same direction. In the photo below, you'll see on the right how the paint looks wrong when it pools. On the left, you'll see the quality isn't great compared to the photos above. That said, from a tabletop perspective, not bad. You're definitely not going to get a ton of colour shift with a paint brush. Thin layers with Green Stuff World paints. Normal to heavy layers with TurboDork paints. Paintbrush multiple layers, being careful of pooling. I also painted up a quick demo model to see the effect in practice. Tried a darker skin tone on the face, some anime hair and NMM on the gun. I didn't highlight the armour, but I did paint black into the crevices. You may ask yourself how you might highlight when using these paints. It's an awkward question in general when you're working with metallics. 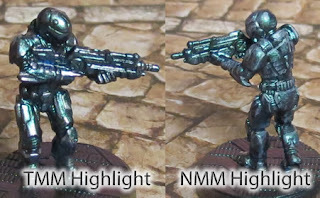 That's a different topic though, which you can read about in my Metallic Tutorial Index. In typical fashion, I've highlighted here after basing with the colour shift paints. You can see two approaches here. 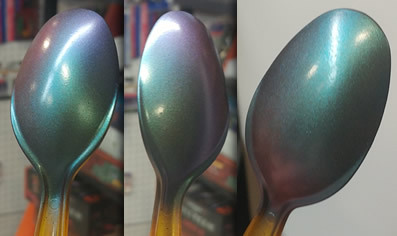 On the left, I've done a TMM (True-Metallic Metal) highlight using silver. 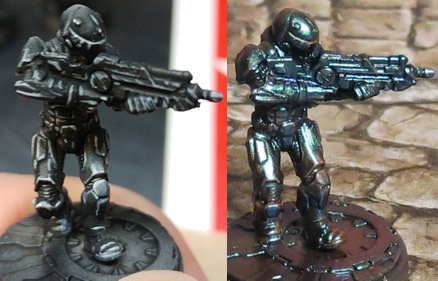 On the right, I've done an NMM (Non-Metallic Metal) highlight using grey. 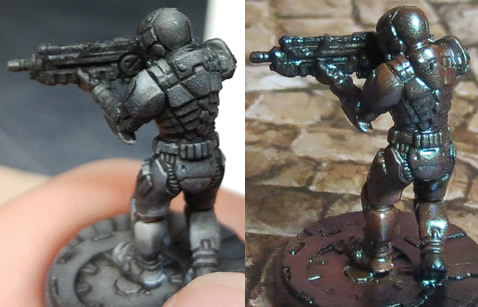 With both, I did a little edge highlighting and dry-brushing when applying the paint. It's neat how each creates a different feel. The other option, is to preshade. I'mmmmm actually really proud of this one - it's something I've been wanting to try since I started thinking about this post. The theory was that if colour shift only shows up on a black base, then a preshade might be the most effective way to highlight. It didn't exactly work out that way since colour shift DOES show up on a white base, just wrongly, (Like in my white-base example above.) but it still made a pretty cool effect. The highlights here are more obvious on the base model, but turns out more subtle in the final photo. To paint this, I've just used white to edge highlight the armour. On this one, the highlight is subtle in the first image but ends up very obvious in the final one. 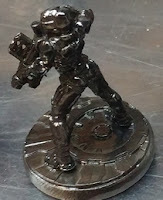 To achieve this, I airbrushed grey over the black base then washed it black, before glossing and painting. You could achieve a similar effect using dry brushing. I'm a big fan of how this one turned out. In some ways, it created an anodized / heat treated metal appearance. Can you wash colour shift paints? Absolutely, no different than washing other metallic paints. It adds another dimension. Pretty optional. In general, it's a good idea, but varnishing metallics always affects how things look. Not much in the way of surprises here.. Gloss has whiter larger highlights, Matte is duller and things look in between without the varnish. 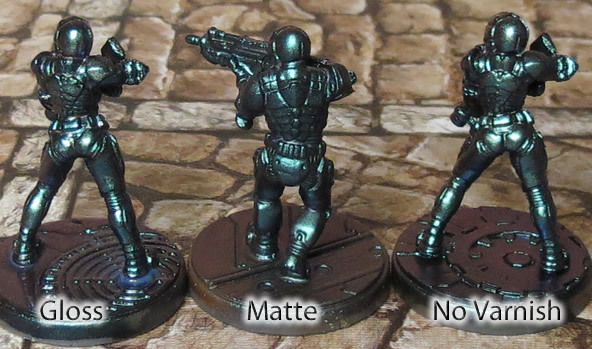 You can also paint colour shift paints over other bases than black, but results are definitely going to vary. 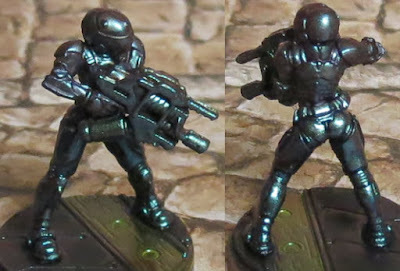 In the case of this green-primed soldier below, the metallic definitely comes through, but the colour is similar to the miniature I primed in white. I imagine you'll need to stick with very dark shades of paint and some experimentation to pull this off. I'd compare this result to the white-based miniature as well. You don't get the colour shift you're after and visibility becomes poor, but you do get a little light shining through. I'm not exactly sure where you'd use this. Both manufacturers offer good quality colour shift paints and different lines of colour so you can purchase from each depending on the style that you're after. They come in dropper bottles, which is great for direct use in an airbrush, the better way to paint with them. The paint is thin enough that details won't be obscured, even after multiple layers of paint required for the colour shift to come through. TurboDork's had a smoother finish while Green Stuff World's was a little more rough. This meant that TD has smoother gradients while GSW's had a little more texture. You can paint easier over GSW's while I needed to paint gesso primer on before painting over TD's. GSW's shade colour was easier to see and achieve while TD's was more subtle. Neither paint turned out as vibrant as the images on their websites, though that's not to say you don't get a nice colour shift from them; you certainly do! TurboDork is planning on updating their images to present their product in a more natural environment and creating some tutorial videos as well. I've recommended they also update their instructions to suggest painting normal layers of paint and update the colour swatch on the bottles which doesn't actually display the colour shift, just metallic. Ultimately, both products offer something to us painters. Colour shift paints add a new dynamic to the miniatures we're creating and I'm excited to apply them to full projects, of which I already have two in mind where I'm planning on using them. For best results, I definitely recommend testing the paints before diving in but once you get it layering right, they become a great new category of paint to add to your toolbox.